I am considering a career in finance (along with law, pr, and being a ninja) so when I find news about it AND the fashion world I get all excited (except when I hear about Models and Bottles - ugh and double ugh). This picture, however, made me giggle profusely. What we see here is the CEO and Chairman of Goldman Sachs, Mr. Lloyd Blankfein, wearing a pair of acid wash denim jeggings. I found this lovely photo and the following information from The Cut. My first reaction was "WTF? NO WAY!!" And my second reaction was "WHO PHOTOSHOPPED THIS?" And yes, it was photoshopped by The Cut. The people at Goldman think that these will be a hawt selling item for the winter/fall season for all levels of clothing sales (luxury, moderately priced, low priced). If only he would actually wear them. (I hope not. I would die of laughter and I have so much more to experience in life!) Now that would be true sign of dedication to the data findings. I do not apply to this data because I will not be buying any. I don't think that they are a good look for me. What do you think of Jeggings? What do you think of this picture? Are you thinking about working and/or actually working in finance or fashion? Let me know!!! p.s. Found the CUTEST widget-turtle. What do you think? 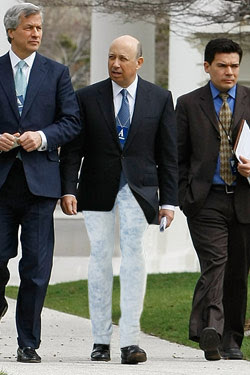 I'm sorry, but that picture is so so wrong in many ways... Chairman of Goldman Sachs wearing acid wash denim leggings? I need eye bleach! Not a good look for me, either. @Abby I know!! It's so wrong which is why I find it HILARIOUS. @Leslie Interesting! Both have their main spots in NYC so I can see the marriage thing being true. This wasn't photoshopped???? Wow!! He must have lost a bet!